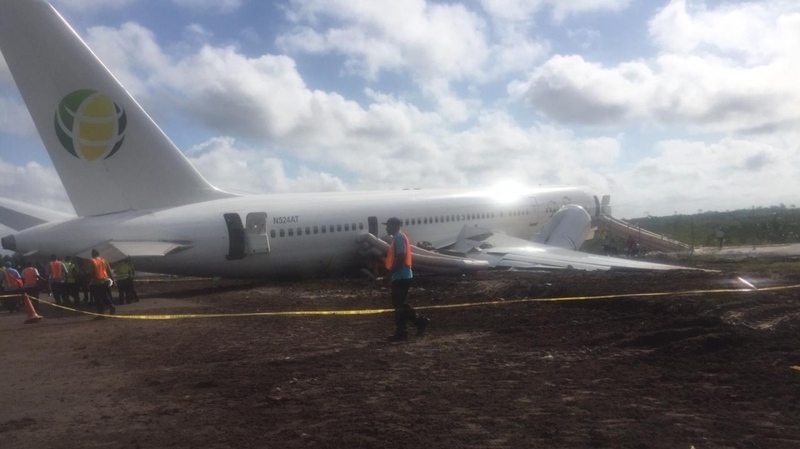 Ten people were transported to hospital after a Fly Jamaica flight carrying 82 Canadians bound for Toronto crash-landed in Guyana following a technical problem on the plane that one passenger described as a “very scary” experience. Global Affairs Canada confirmed to CTV News that 82 of the 128 passengers on Flight OJ256 were Canadian. The agency said they have no reports of any Canadian citizens being injured in the accident. “We wish a swift recovery to those who are injured,” the statement said. The Boeing 757 aircraft left Georgetown, Guyana just after 2 a.m. local time Friday morning, according to Minister of Public Infrastructure David Patterson. Airline spokesperson Carl Bowen said the pilot reported a hydraulic failure emergency shortly after its departure from Cheddi Jagan International Airport. The aircraft returned to the airport less than 20 minutes after takeoff, government officials said during a Friday morning press conference. The plane overshot the runway upon landing, Bowen said. 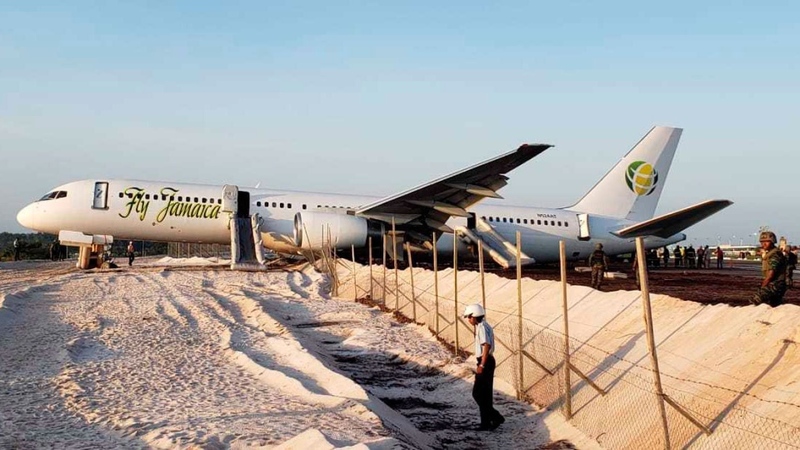 Images on the airport’s Facebook page show the plane crashed into a chain fence. Bowen said the aircraft’s right wing and engine were badly damaged after the plane eventually came to a halt at the northeastern takeoff end of the runway. Patterson told reporters that 120 passengers – including two infants – and eight crew members were all accounted for following the accident. Dr. Shamdeo Persaud, Guyana’s chief medical officer, said that 10 people were transported to hospital for a variety of injuries. He said they were examining five people for possible spinal injuries and several others for other medical issues, such as high blood pressure. 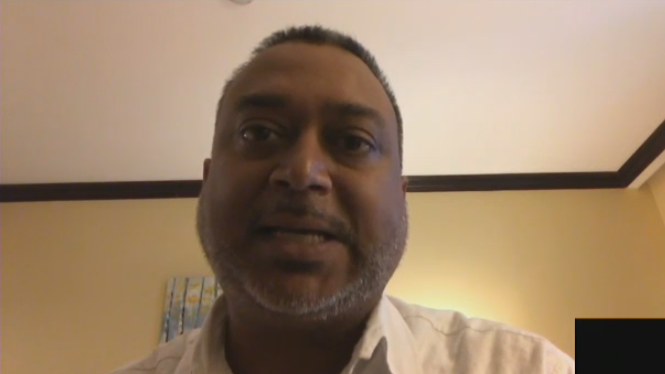 Persaud said at this point, none of the injuries are considered life threatening. Invor Bedessee, a passenger on the plane, said their flight had been delayed for 45 minutes because the aircraft’s front left door would not close properly. The passenger said he noticed they were circling above the Atlantic Ocean for approximately 10 minutes before the captain came on the intercom to tell them there were hydraulic problems and they would be returning to the airport. He said they “overshot the runway” and the crew seemed to have trouble stopping the plane after they landed. Eventually, Bedessee said the aircraft ran over spikes on the ground intended to stop planes and “two or three tires burst.” He also said the plane’s right wing broke off and the plane swerved to the right and crashed into a sand ditch. If the plane had travelled three more metres, Bedessee said they would have gone over the edge of a hill and fallen approximately nine to 12 metres. Bedessee said he thought he might die and said his fellow passengers were also terrified during the ordeal. After the passengers exited the plane, Bedessee said the plane caught fire. “It was a near-death experience,” he said. Cheddi Jagan International said six people were injured and were being treated at Diamond Hospital. The airport said the injuries were not life-threatening. A Toronto woman told CP24 on Friday that her mother was a passenger on the flight. The airline spokesperson said they’re making “alternative arrangements” to fly out the rest of the passengers. Government officials said the airline has made provisions for passengers to be transported to their homes or hotels. Fly Jamaica said Cheddi Jagan International Airport has reopened following the accident. The U.S. National Transportation Safety Board will conduct an investigation into the crash, Guyanese officials said. With files from CP24, The Canadian Press, and The Associated Press. Passenger Invor Bedessee talks about his experience on the plane to CTV News Channel.